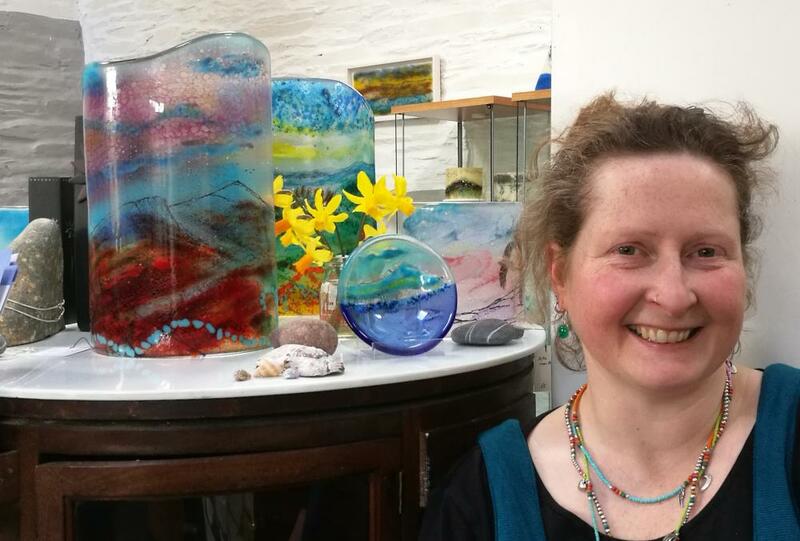 I create my colourful glass from a small studio near Newcastle Emlyn. Layers of glass, paint, pattern, texture and print make up each kiln-fused glass landscape, be it a panel or a piece of jewellery. No two pieces are ever the same, so you can be sure of taking home something completely individual to you and your home. I am surrounded by fields, woods and big skies – endless inspiration - from the Ceredigion/Carmarthenshire border where I live down to the coast of Pembrokeshire: Cardigan Bay, the Teifi and Towy rivers, the hills of the Preselis – Carningli, Foel Drygarn, Carn Menyn. Using the heat of the kiln to manipulate glass in its variety of forms - sheet, powder, enamel – and taking it through a multitude of firing schedules I create windows onto these worlds. You can usually see me at work in the studio, see work in progress and a good selection of finished work. My studio is open to visitors throughout summer, from Easter to September: Thursday, Friday and Saturday 10 - 5. Other times please call or email if you'd like to pop in. From Drefach Felindre, 4 miles from Newcastle Emlyn, go over the small hump-backed bridge and up the valley. Do not turn off anywhere and after about 2 miles you will see the studio sign on the left at the bottom of a track. Head up and park. We've known Moira for a few years, and have to say that as a fellow glass artist, her work is always fresh, inspiring and totally unique. She captures the beauty of the Welsh surroundings so well, and each of her pieces tells a story. I have an original piece of Moira's early work hanging in my kitchen, and I treasure it - the sun shines through and makes the kitchen come alive with all the reflections of the glorious glass - love it! As I work from home, I am available for visits - just give me a ring to arrange a time, or see my website for stockists.